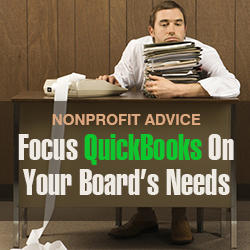 What do Nonprofits expect from QuickBooks? During my many years of consulting to nonprofit organizations in the San Francisco Bay Area and beyond, I have learned that the needs of a nonprofit are NOT significantly different from those of a for-profit company. Another client, a CPA who serves on the board of a natural history museum on Cape Cod, engaged me in a consulting assignment because the board was not achieving significant benefit from their voluminous financial reports. They needed to restructure and consolidate their monthly reports so that they could use them as a platform for analysis, identification of “flags” to be researched, strategic planning and budgeting. Run a nonprofit like a business? Give their boards what they need to make sound financial and strategic decisions? That’s sound advice! It is my strong belief that QuickBooks data should be the business intelligence that is a springboard for management and board members to make decisions, and not just an accounting system for bookkeepers and administrators. Having said that, it is critical that QuickBooks be set up correctly for the IT environment in which its users operate, whether it is on a server, desktop, online or hosted “in the clouds”. QuickBooks must be configured so that it conforms to your nonprofits’ business model and your unique operations. What follows is a “check-off list” and roadmap to help you run QuickBooks efficiently and to achieve seamless integration with all of your organization’s business and marketing systems. If you are in a multi-user environment, insure that all users are on the same version (i.e., 2013) of QuickBooks and that the all updates (releases) are automatically applied. For environments that have workstations (or “clients”) with a dedicated server, you should put your QuickBooks company file on a dedicated computer in a shared folder, and not on the server. Installing QuickBooks on a server often results in conflicts, bottlenecks and inefficient processing. If you are using QuickBooks Premier or Enterprise, insure that you install the nonprofit edition on all PCs, and insure that automatic updates are enabled in your preferences. If your nonprofit has a retail store, insure that you operate it as a separate point-of-sale facility, especially if you have cash registers or accept credit cards as payment for products. There are many third party Point of Sale systems that seamlessly integrate with QuickBooks. POS solutions may be found at the Intuit App Center (https://appcenter.intuit.com/ ) or at the Intuit Solutions Marketplace. Explore third-party applications that will integrate interfacing systems such as banks, websites, shopping carts and checkless bill-pay applications. Make every effort to eliminate intermediate data files such as spreadsheets, and to eliminate or reduce manual operations. While in QuickBooks, press Ctrl-1 to bring up the Product Information window. Pay particular attention to the number of database fragments; if it is greater than 9, you should defragment your database. There are several methods for accomplishing this and your system administrator or ProAdvisor should be able to help. This screen also shows your database size, the version and release that is installed, the location of your company file, and the number of items in all of your lists. An effective nonprofit board is visionary and manages its budgets and restricted funds in accordance with industry standards and ethical principles. They need business intelligence and high-level financial reports that will help them in their strategic planning and forecasting. Insure that your QuickBooks company file meets GAAP standards and is auditable. First and foremost, nonprofit boards need to analyze budgets versus actual income, expenses and cost of goods sold. Insure that your budget is based upon last year’s P&L and adjusted based upon current year’s projections and changes in strategic plans. Maintain your budget in QuickBooks, and not in outside spreadsheets. A report most valuable to the Board is the Profit and Loss Budget Performance report. Try to keep board members out of day-to-day QuickBooks functions such as payroll, accounts payable and accounts receivable. Instead, provide them with high-level summarized financial reports that give them business intelligence upon which to make major decisions. A very effective method for giving nonprofit boards graphic displays with charts, reports that can be filtered by class or by range of dates, and key performance indicators is webKPI (www.webkpi.com ). QuickBooks data, including budgets, is loaded periodically “into the clouds” and can be viewed and analyzed in graphs, charts and pivot tables without board members having to log in to QuickBooks. In many cases, the webKPI dashboard completely replaces printed QuickBooks financial reports. If you need outside help, the first source for locating a QuickBooks expert in your area is to click on the Help dropdown menu and then click on “Find a local QuickBooks expert”. This will take you out to Intuit’s ProAdvisor database. Another excellent way to find the right person is to do a Google search or a search on Craigslist and specify your precise requirement (i.e., “help set up QuickBooks for a nonprofit”). Make sure you go out to the consultants web site, such as www.bizpropete.biz to insure that you have confidence in your solution provider. Carefully go through all User Preferences and set preferences to conform to your operations and business model. Be sure to set the reporting method to Accrual or Cash so that this default matches your reporting method on your tax return. Limit your Chart of Accounts to meaningful, high level and generic accounts so that your P&L and Balance Sheets can be produced on no more than two pages. In QuickBooks, you can map each account in the Chart of Accounts to a tax line in your tax return. Insure that your company information includes the correct tax return (i.e., Form 990 – Exempt). Produce a Chart of Accounts listing and insure that all accounts are mapped to a Tax Line or are <Not tax related>. Insure that accounts for restricted funds and non-restricted accounts are separated. Restricted funds may be posted to equity, current asset or dedicated bank accounts. Unrestricted funds are typically retained in bank accounts. Use Classes wisely. Classes may be for physical locations (i.e., branches or districts), or for organizational structures (i.e., departments) or for classification of funds (i.e., restricted, unrestricted or administrative). Insure that you do not have redundant data. Intermediate data repositories such as Word documents or Excel spreadsheets should be avoided. Avoid making journal entries! Journal entries are simply postings of matching debits and credits and have no relationship to transactions or lists (customers, vendors, employees, service items or inventory items). A simple deletion of a journal entry in a prior year can create an imbalance between your books and your tax return. After graduating from the U.S. Coast Guard Academy with a degree in Engineering, Pete Bornstein served as an officer on several assignments in the Pacific and in California. During his six years in the Coast Guard, he was Commanding Officer of two Coast Guard units. His information technology career includes systems design and development positions at IBM, EDS and Chevron. He possesses superior technical skills, particularly with regard to relational database systems design and development. Pete served in project management roles designing, developing and managing major financial systems projects at Chevron and Household Financial Services. For the past nine years, Pete has provided business consulting services to many non-profits, service organizations and manufacturers in the San Francisco Bay Area. His emphasis is on providing accounting systems for these organizations and integrating their business applications seamlessly with company web sites and other installed applications and shopping carts. Because he has been certified by Intuit as a QuickBooks Advanced ProAdvisor since 2004, he can bring to his clients superior knowledge of the practices and procedures that best serve a client's business model. Pete is a creative and thoughtful solutions provider. Pete is the Leader and Coordinator of the San Francisco Bay Area chapter of the National Advisors Network (NAN). This group of professional consultants who network to promote exemplary service to their clients meets monthly at various venues throughout the San Francisco Bay Area. Members of NAN collaborate with each other to help build their respective practices. Pete is a contributing member of Intuit's Design Delight team of advisors. This select team of business consultants evaluates new features and functions of QuickBooks, and recommends enhancements and new features to improve the functionality of QuickBooks and to make the family of accounting products more productive and efficient for its users. He also has consulted with Intuit on building a channel marketing network of ProAdvisors to market Intuit’s loan manager products. Pete Bornstein's business philosophy is to form a long-term partnership with his clients based upon common goals and objectives and a strong desire to achieve perfection. He works diligently to insure that both he and his clients have a very clear understanding of what it will take to achieve success in today's extremely complex technological and financial business world.